Take a bowl add curd mix well then add maida,cornflour mix well to avoid lumps then add food colour,table spoon of hot oil and mix again. Take a bowl add sugar,water to make sugar syrup of 1 thread consistency add lime juice few drops in the syrup and keep it a side.Lemon juice is to prevent crysalization so just add few drops. 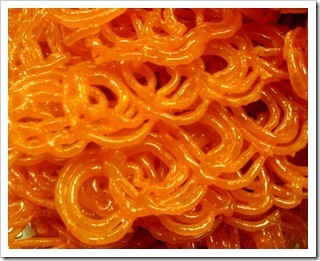 Heat oil to fry jalebi, take a Ziplog bag make a hole and pour the batter so that it can pass through. Fill the batter in a ziplock bag, press the batter in the hot oil fry at a very low flame till golden brown colour. Remove from the oil drain the oil, immediately dip in the sugar syrup for a minute and place them in a plate.